M65 and M66 form a beautiful pair of galaxies in the constellation of Leo, and even a triplet with the NGC 3628 galaxy. Charles Messier entered the first two in his catalogue in 1780, but did not suspect the existence of the third. M65 is a spiral galaxy located, like its two neighbours, at about 35 million light-years from us. In the nucleus of M65 three supernovae were observed: in 1973, 1989 and 1997. A telescope of at least 100 millimetres in diameter can be used to see the fluffy appearance of the three galaxies. 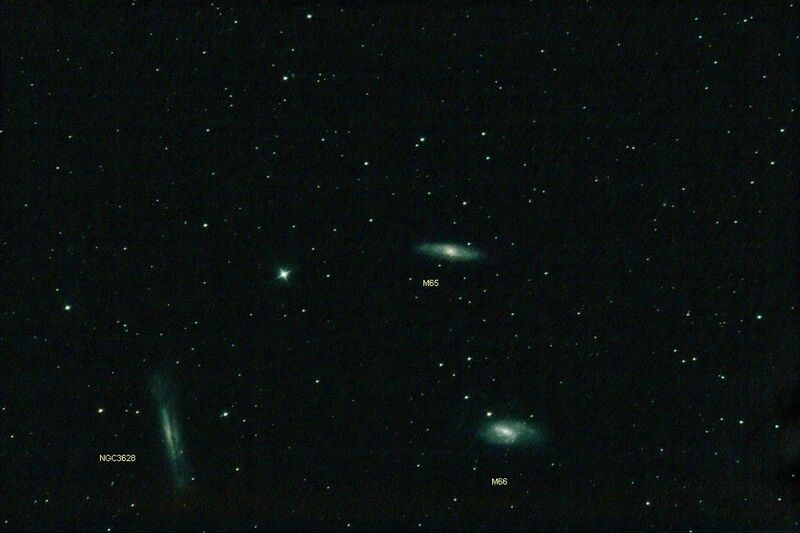 The trio in Leo, the M 65, M 66 and NGC 3628 galaxies. Credit "Chamois", the person's pseudonym on the forum.